When you plan for breakfasts in the morning, it becomes relatively easy to manage if you have ready to use Idly or Dosa batter on hand. My boys love to eat Dosa most days, while Konda is off the Dosa for a while, which is sad as she used to love Dosas so much. Anyway her fancy is anything with bread these days. But one can’t offer the same dosa every day of the week for the elders at home right. Moreover with the eating habits changed much, I sometimes have to pack Dosas for lunch or even Dinner. Then there are the times when I think I should reach my target of 101 Dosa Varieties and pester Amma to come out with some new proportions. It was one of those moments when Amma ended up trying out this instant Ragi Dosa and I must say it turned out very delicious. By definition, we can call this instant as this batter need not be fermented after being ground. But Urad dal needs to be soaked and ground to a smooth batter. 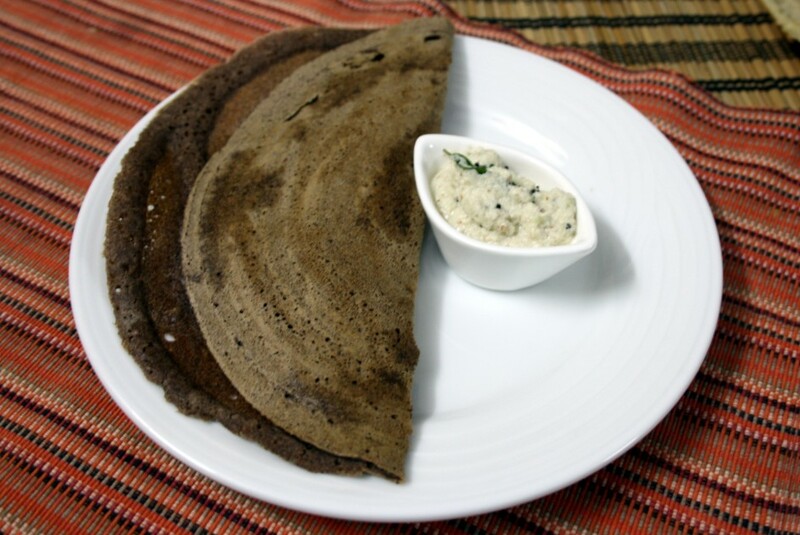 Normally any dosas made with flours like Wheat, Ragi, Jowar and others etc, are quite instant dosas. When you want to make crepes with these flours, you just have to blend into a smooth batter and make them right away. So Amma wanted to ferment overnight and see. Result was fantastic. Moreover when you make like this, you can refrigerate the batter for couple of days if needed. Makes a great change from the regular one. And very healthy for a Diabetic Diet. Wash and soak Urad dal for 5 hrs along with methi seeds. Then grind to a smooth paste. Blend the ragi flour with water and mix the ragi flour to the urad dal paste along with Salt. Heat tawa, grease with oil. Spread a ladleful of batter and sprinkle oil over this. Cook on both sides. We make it in a different way. We soak equal amounts of urad and dal and grind and then add ragi flour to it. It gives a very nice taste due to rice, but of course if you don't want rice, I guess it is the same as what you've made. 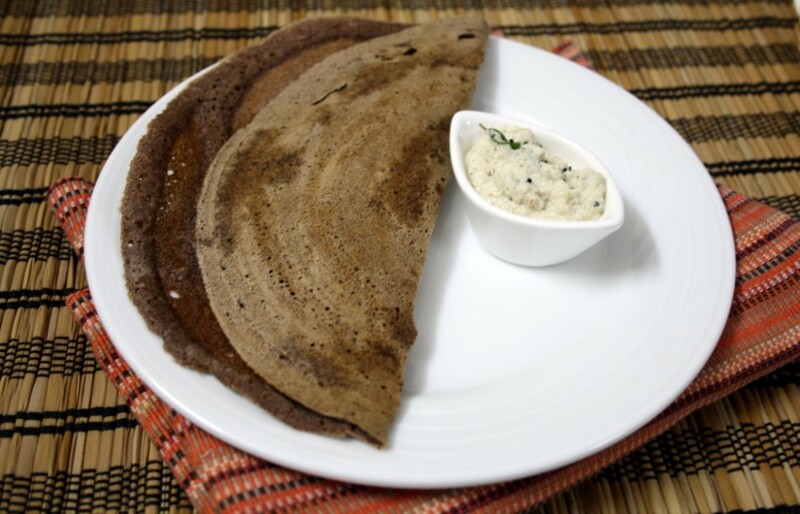 Healthy and nutritious, a diabetic friendly dosa. I just ate the very same dosa a couple of days ago. MIL makes Ragi Dosa and Ragi Idli and has introduced me to new delights! A totally healthy option, i agree! Valli, are we have a BM this month?